First I would like to tell you that I have been a Bugeyes user for the last three years and could not imagine ever riding with out them. I first use them on a cross country snowmobile trip in northern Ontario with six other sleds and immediately became dependent on them. 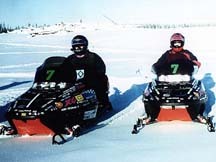 Having participated in other cross country sled trips in the U.P. of Michigan I remembered how sore my neck got after just two days of stopping and turning my head around to look back and verify the sled behind me made the turn. On this particular Ontario trip one the guys I was riding with picked up 10 Bugeyes from the Novi snowmobile show and ask if any one wanted to give them a try. Remembering the my sore neck I thought for ten bucks it was worth a try. I had rode with a friend on mine who used the wrist mounted mirrors. He said that he was not impressed with them because he found them hard to use and I didn't much like riding behind him because every time he raised his hand to use the mirror I thought he was signaling to stop or warning of a hazard. After the first day of getting use to them I was hooked. No more sore neck. During the day I could not only see if there was a sled behind me, I could see who it was. At night with a slight turn of my head I could verify that the guy behind me was still there. I have since tried them on my dirt bike helmet and have found them to be useful in single track dirt bike trails. As I became more proficient with using my Bugeyes I found that even with the intense concentration necessary to navigate a 300cc two stroke motorcycle through tight single track trail, I could still find a place on the trail to steal a glimpse behind me. This is nice if you are riding with someone or if you have someone like Alan Randt riding behind ready to ride over you if you don't get out of the way. Thank you for this great product. It has made something I love to do even more enjoyable. I am going to install them on my street bike helmet this summer and have no doubt that they will be a 100% percent improvement over the stock mirrors on my vibromatic 600cc four cylinder Japan produced street bike. I used the Bugeyes in the 1999 IRON DOG GOLD RUSH CLASSIC. The 1971 Mile Race across Alaska, from open ocean to dense forest. I always knew where my partner was, with a quick glance in the distortion free mirrors. The Bugeyes performed flawlessly, very easy to adjust, and get used to. All on my competitors asked where I got them from. I WILL BE USING THEM ON ALL OF MY HELMETS. ... In August, our little group of dirt bikers rode the Michigan Cross Country Cycle Trail, the "Trail Safari". 450 miles of narrow trail, two tracks and dirt roads. Rain, dust, dirt and mud. The Bug Eyes held up. They never got knocked off, rarely got bumped out of adjustment and even survived a couple of crashes. My riding friends were folding their "trick" Dual Sport fold-down handlebar-mounted mirrors out of the way in every trail section. What's so "tricky" about that? Four Hundred miles, three days of sand, dust, mud, rain and a few crashes, which I may not admit to, The Bug Eyes passed my "Michigan Trail Safari Test" with flying colors!! I can actually see behind me now! No vibration!!! They're mounted on your helmet, not your bars. My old handlebar mounted mirrors are now hanging on a nail on my garage wall. P.S. The group of riders which I rode the Trail Safari with in August, all now have Bug Eyes. I gave them each one from the box which you sent me, I was curious to see if they would give up their handle bar mirrors.